While based on the real-life trajectory of the iconic rock band Queen, led by the legendary singer and showman Freddy Mercury, the film “Bohemian Rhapsody,” released Oct. 23, has been met with mixed reviews. While more than a decent introduction for novice or casual viewers to the singer and his band, hard-core fans of the group that left an indelible impression on pop music from 1970-1987 with their high-octane melding of progressive rock and heavy metal, and which embraced many social causes, may feel disappointed. The biggest drawback to the film is its pacing, which could be attributed to the fact that it had two separate directors. Bryan Singer directed two-thirds of the film, but due to conflicts with some of the talent, he quit before finishing the project. Dexter Fletcher took over directing responsibilities, creating an obvious difference in styles in the film. Maribel Garcia, digital media arts major, saw the film and noticed a glaring problem that other critics mention. An example is that the transition between the band members first meeting each other in the early 1970s to concluding their third studio album in late 1974 takes about 12 minutes, while the recording of their admittedly first mega-hit, 1975’s “A Night at the Opera,” takes up about 20 minutes. There are also several other faults, such as focusing too much on Mercury. I understand he is the most exciting member of the band and revered as one of the greatest frontmen of the 20th century, but the focus on Mercury is so heavy that it pushes the other three equally important members of the band into the background. Many times, it feels like the film is trying to tell Mercury’s story and not Queen’s, despite calling itself a biopic of the band. The strongest part of the film is the solid acting from Rami Malek portraying the eccentric and flamboyant Mercury, as well as the supporting cast, who look almost identical to the rock stars they are playing. Malek does an exceptional job capturing what it meant to be Mercury, and his singing brings the character back to life. Another strong positive of the film is the detail of the costumes portrayed during iconic concerts the band played. Everything down to the drums design as well as Brian May’s guitar paralleled real life. Yet, that wasn’t enough to ignore the fact that there were several facts the film got wrong. For example, the film illustrated Mercury wanting to pursue a solo career as a shocking and catastrophic event for the band. Yet, in real life drummer Roger Taylor and guitarist Brian May had already done their own solo projects years earlier. Another misleading aspect of the film is the ending. In the film, the band has taken an extensive break from talking to Mercury and then decided to regroup to play Live Aid in 1985. The decision of them regrouping was a touching moment in the film meant to display members putting their differences aside to play together after about a year of not speaking to each other. However, in real life, Queen had been touring Japan months prior to Live Aid. While those are mostly forgivable oversights, the issue at the heart of the band’s latter days isn’t. The film shows Mercury telling his bandmates that he had AIDS right before Live Aid which was July 13, 1985. Yet, numerous sources detail that he wasn’t diagnosed until April 1987 (he died in 1991). 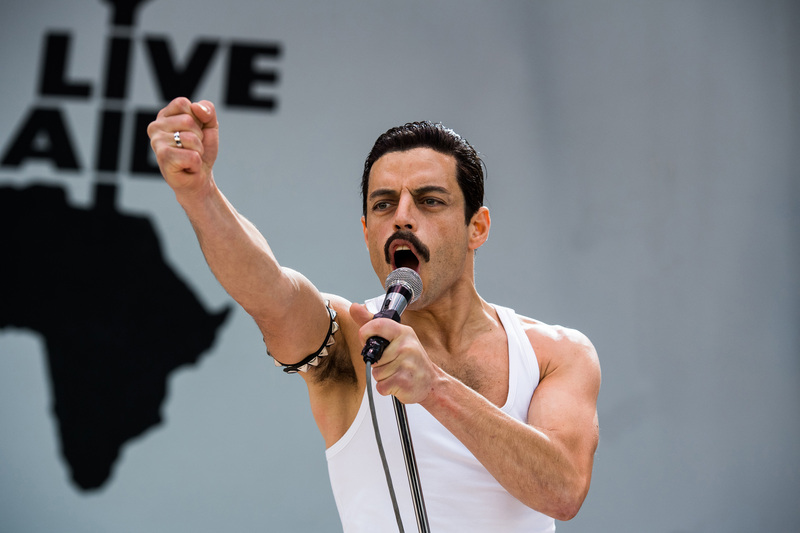 It seems the film wants to place so much emphasis on the legendary Live Aid performance that it decides to warp historical accuracy to suit its purposes. It feels too convenient, at least for those of us who know the actual history of the band. Yet, these flaws aside, this isn’t in any way a bad film. It portrays each band member honestly and shows Mercury’s intimate life in ways that seem to reflect how those who knew him personally have related. However, it isn’t enough to ignore the glaring issues in the film, most notably that it seems stuck between trying to please Queen fans by playing their biggest hits and delivering a Mercury movie that focuses on his trials and tribulations as a rock icon.